AIM: The purpose of this study was to consider the impact of the smartening schools on creativity and academic achievement among sixth grade students in Meybod. RESEARCH METHODOLOGY: An experimental study with random cluster sampling method was conducted. The data collection method of the present study is semi-experimental with a pretest - posttest and control group design. The participants of the experimental group were selected from Imam Jafar Sadegh school. It is an intact class of 24 male students, studying at the sixth grade of elementary school. Further, a class of 21 male students, studying at the sixth grade of Haj Jawad Jandaghi elementary school, was selected as the control group. In this study, the experimental group had received training on smart schooling tools, while the control group using the traditional methods. Torrance's creativity questionnaire was used to measure student's creativity. In order to assess the student's progress during the course, their scores on both first and second semesters were used as pretest and posttest. The data were analyzed using SPSS Software Version 21 (IBM Corp.) through ANCOVA. RESULTS: The results revealed there have been meaningful differences between the achievement and creativity of the students who received their training through intelligent training. They showed higher degrees of achievement and creativity than those who receive their studies regularly and without intelligent training. CONCLUSION: Creativity is not just certain individuals, including thinking and mental function. However, almost all people, including children, students, workers, farmers, and housewives in school, at work, and even farm, have an average intelligence quotient in various fields of life, which can be creative performance. AIM: The aim of this study is the evaluation of the effect of narrative therapy on the resiliency of women referred to counseling centers in Isfahan. METHOD: The study was quasi-experimental, with pretest, posttest, and control group. The statistical population was women who had marital problems and had referred to counseling centers of Isfahan. At first, by the use of available sampling, three counseling centers of Isfahan were selected. Then, by available random sampling, 30% were selected and were randomly put into two groups of experiment and witness. First, all samples answered to the Connor–Davidson's resilience scale. Then, the experiment group took part in eight 2 h sessions of group narrative therapy. And finally, the posttest of both experiment and control group was performed. To evaluate the data and analyze the results of this study, the analysis of covariance was implemented. RESULT AND CONCLUSION: Findings have shown that the process of narrative therapy sessions has had a significant impact on the increase of tolerance (P = 0.001). The results of this study can be implemented in increasing of women's resiliency. 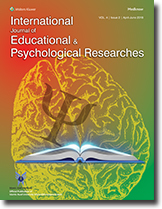 AIM: The purpose of this study was to evaluate the relationship between basic psychological needs satisfaction with resilience and marital satisfaction in Sabzevar (Iran) teachers in 2014. METHODS: Method of this research was descriptive and correlative. Population of this study was female teachers of schools (secondary-high school) that are totally 324 individuals. A total of 174 individuals were selected as case studies among population, using accessible sampling method and with the help of Cochran's formula. Connor and Davidson Resilience Scale for Adults, marital satisfaction scale (ENRICH 47-point) and basic psychological need scale were used to collect data. RESULTS: The results showed that all variables (autonomy, competence, and relatedness) have a significant positive correlation with resilience and marital satisfaction. Relatedness and autonomy had the most significantly and positively predicts respect to resilience and marital satisfaction, respectively. CONCLUSION: According to the results, it can be said that the basic psychological needs satisfaction can be beneficial in term of increasing the resilience and marital satisfaction, it also improve their performance and mental health. INTRODUCTION: Knowledge management (KM) helps organizations to find, select, organize, and publish important information. On the other hand, organizational culture is considered as a major player in KM scene. Organizational culture is a common and relatively stable pattern of values, beliefs, and fundamental belief in an organization. The current hospital structure is a structure that provides a proper balance between hospital management and medical staff. METHODOLOGY: The current research is a descriptive correlational. Based on Cochran formula, the sample size was 200 people. Data analysis was performed using SPSS (version 16). The instruments used in this study were a standard organizational culture questionnaire with 56 questions with reliability was 0.8 and a standard KM questionnaire including 33 main questions based on Likert scale with reliability of 0.89. RESULTS: In the analysis, the relationship between organizational culture and KM relationship was compared. For comparison and determining the relations, Pearson's correlation coefficient (ρ) was used. In accordance with the tables regardless of the size of each of the variables, the relationship between variables was direct and strong and statistically it was highly significant (P > 0.5). DISCUSSION AND CONCLUSION: Average scores of KM have been close to mean. The application, use, and reservation of the knowledge had higher mean values than others did. So perhaps, we can say employees better managed to use, store, and maintain knowledge. In contrast, they were weak at distribution and sharing of knowledge. AIM: The purpose of this study was to the effectiveness of self-regulated learning strategies on math anxiety of dependent cognitive style school students. SUBJECTS AND METHODS: This quasi-experimental study was conducted with pretest-posttest and control group. The statistical population included all first grade high school female students consisted of 136 participants in the academic year 2014–2015, and the sampling method was random sampling. The instruments of this study were: The math anxiety questionnaire (totally 30-item scale, the scale is a 5 Likert-type scale, Cronbachs alpha 0/86) and instruments was Witkin's Group embedded figures test and 18 is the geometric shape, each of which consists of several irregular geometric shape. Concurrent validity for men 0/82, and for women was 0/63 in the pretest questionnaire completed math anxiety by the students and students had high math anxiety in the experimental two group and a one control group were replaced. The experimental groups received training in self-regulated learning strategies method in order to analyze the data. In all hypotheses, ANCOVA analysis and SPSS 22 (IBM SPSS Software SPSS Statistics is a software package used for statistical analysis) was used. RESULTS: According to the findings, the self-regulated learning strategies training is reduced math anxiety of dependent cognitive style school students. CONCLUSIONS: Employing the self-regulated learning strategies training reduced the math anxiety of dependent cognitive style school students. INTRODUCTION: Being exposed to violence at workplace is threatening to healthcare staff. Increasingly violence has been cited by nurses as the most important reason for leaving nursing profession. The current study aims to study the status of violence against medical staff of psychiatric hospitals affiliated to Isfahan University of Medical Sciences. METHODOLOGY: This study is a descriptive-applied research which studied 151 nurses working in Farabi and Khorshid hospitals in 2015. The tool for information gathering which was a standardized questionnaire on “workplace violence against medical staff” was filled in by the respondents. The study's questionnaire includes demographic information and two types of violence and abuse: physical and emotional (verbal aggression, bullying, racial, and ethnic). Chi-square test, t-test, and analysis of variance and logistic regression tests were used for statistical data analysis of answers. 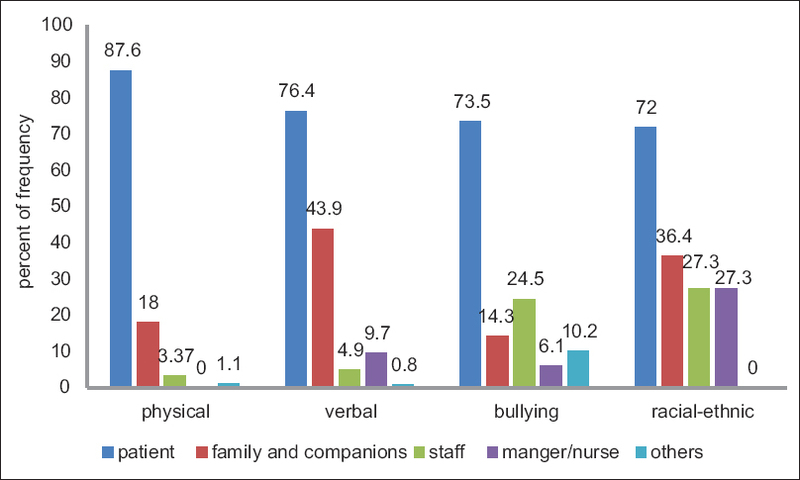 RESULTS: The results indicate that 58.9% of nurses have experienced physical violence while 81.4%, 32.4%, and 7.3% have been exposed to verbal violence, workplace bullying, and racial and ethnic violence, respectively. The most cases of violence have been perpetrated by patients and their families or companions. There was not a significant relation between likelihood of being exposed to different types of workplace violence and the hospital, level of physical contact with patient, and patient gender. CONCLUSION: Given the rate of reported violence in medical centers, the health authorities should make every effort to reduce healthcare-related abuse and violence through using of proper preventive strategies, proper management, taking safety measures, and increasing public awareness about all aspects of the issue.